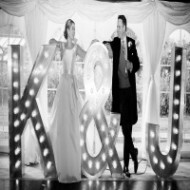 Trends in wedding styling can come and go, but at Wedding Letter Hire we love letter lights, and we think that our marquee letters are here to stay on both the UK and US wedding scenes. Trends and ideas for themes usually hit social media first and recently we have seen lots of fabulous wedding bloggers and pinners who have been naming marquee letters as the on-trend wedding accessory for 2014. Pinterest is a really popular resource for brides and planners and we have seen some gorgeous and unusual ways to use personalised initials and letter lighting to add a special touch to a couple’s big day. Trends for 2014 are really focused on the individuality of the couple and celebrating their passions and personality – so what could be more unique than creating your very own words and phrases out of large wedding letters. There is also a really glamorous feel about weddings in 2014 with popular culture such as the Great Gatsby and Downton Abbey inspiring brides to return to the days of Hollywood chic for their celebrations. Of course our sophisticated marquee letters are the perfect accessory for this theme. We also know that real brides love our illuminated letters too. We were lucky enough to exhibit some of our marquee letters at Brides The Show in March and the feedback from the brides-to-be was fantastic. They loved the way that they looked and the fact that they were so versatile. There is something really special about out twinkling lights and at 5ft high they are a real eye-catcher at any wedding. They are easy to transport and can be used at practically any venue. They can work for any budget too as you could hire simple initials or whole words. It’s not surprising that more and more people are choosing to hire large letters to make their wedding sparkle.